If the Mercedes-Benz brand is fine dining, then their C350 might just be that amazing little neighborhood joint a great chef opens. It's never going to see a Michelin star, but the food and service are consistently great. Nestled below the AMG-tuned C63 sits the C350, a blend of affordable luxury and sporty drivability. Though it’s true some compromises have been made to ensure it stays under the $40k mark, the luxurious appointments in the sedan are full-on Mercedes-Benz. At even the base level, conveniences like heated seats and Bluetooth interface are a given. The drive, though more brawny than the C300, lacks the intimate feel of some of the more aggressively sporty Mercedes-Benz models. Despite this, the C350 holds its own in tight corners and masterfully softens the suspension to avoid the shake, rattle and roll over potholed city streets. While the interior is typically comfortable, we'd like to see it move more into the 21st century and clean up the tech interfaces. It may not be the restaurant with a six-month waiting list, but the C350 will sate a discerning appetite. V-6s aren’t known for their perfect pitch. That didn’t stop Mercedes-Benz from attempting to make it growl like the best of them. The smaller engine achieves a fairly green 25 mpg on the highway. Its base MSRP includes enough standards to keep buyers from venturing too deeply into the options list, meaning the price will stay nice and low. Rear visibility is limited, so where's the optional backup camera? It's a must for a car with a spyhole for a rear window. Sport seats look great, but the rear ones offer little in the way of comfort during a long journey. The navigation interface needs tweaking big-time. It's easier to whip out an iPhone than deal with it. In the C350, the feel of the drive depends almost entirely on whether you’ve slipped the car into Comfort or Sport mode. Gears are dropped more quickly and held longer in Sport mode, though acceleration still doesn’t reach competitive levels. Suspension is tightened up too. Body roll around tight corners – a sacrifice to the Comfort god – is replaced by a decidedly taut suspension in Sport mode. But fear not, city-dwellers, even the more eager driver won’t ever see the C350 completely shun all levels of bump absorption. As a healthy alternative to the aggressive half of the C350, Comfort mode starts the sedan in second gear to add smoothness to the drive. Though as an unfortunate side effect, second becomes dreadfully long, leaving you missing that punchiness associated with the brand. Best to switch back to Sport mode if that bothers you. Falling short of expectations is the steering, which although better weighted than the previous generation's, still doesn’t have much feel to it at lower speeds, where it shines on the highway. Road noise permeates into the cabin more than we’d like as well. The 3.5-liter V-6 engine produces 268 horsepower and 258 lb-ft of torque, numbers inferior to the competition. The Audi A4 is just a few hp shy of the C350, but has a smaller 3.2-liter engine and BMW's 335i blows by it with 300 hp. The rear-wheel drive car puts power to the wheels via a seven-speed automatic transmission, which we like a lot. To counteract the claustrophobia some may feel in the snug rear seats, the optional Panorama roof is the ticket. Essentially, it’s a second moonroof over the rear cabin area but its presence drastically opens up the interior. For driver comfort, the C350 features rain-sensing windshield wipers, a tilting/telescoping steering wheel with easy-touch controls and a tire pressure monitor, which are all standard. If we had some extra cash, we’d pony up for the iPod integration kit and 18-inch AMG alloys too. Audiophiles will love the base system in C350 with eight-speakers system and MP3 capability, an auxiliary input jack and Bluetooth interface. But the Harmon/Kardon surround-sound system with voice control will blow you away. What doesn’t live up to the Mercedes-Benz namesake is the navigation system – a slow, menu-filled affair that desperately needs an update. At 17 mpg city and 25 mpg highway, the ULEV emissions-rated C350 hits the segment average squarely on the head. Its seven gears and V-6 engine keep highway cruising efficient as possible, but around town, the numbers could be improved upon. Sport seats restrict movement in the front – great for spirited driving – but similar bolstering in the rear is unnecessary and uncomfortable. Ergonomics are superb, barring the strange placement of the cruise control stalk – directly situated above the one dedicated to lane change signals. How did that one get by the German engineers? We’d also love an update to the navigation system and the surrounding buttons. The competition has moved on, Mercedes-Benz should too. Considering this is the ‘budget’ Mercedes-Benz, you’d think exterior looks would reflect that. It turns out to be quite the opposite. Striking lines cut elegantly through every one of the 182.3 inches and the C350’s 3,615 lbs appear to be light as a feather thanks to a low roofline, 17-inch wheels and wraparound headlamps. At a class-average starting price of $39,000, the C350 won’t waver much beyond that if you resist the add-ons. They’re a pricey bunch, but most won’t need them with all the standards available. Cross-shopping is a must, since the segment features heavy-hitters like the BMW 335i ($40,300), Audi A4 3.2 FSI ($40,400), Acura TL ($34,955) and Cadillac CTS ($37,535). 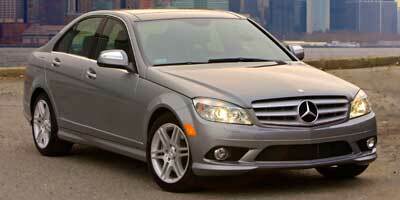 Despite some niggling issues, the C350 is the perfect starter, ‘sporty’ Mercedes-Benz. The price seems shockingly reasonable when presented with the total package. Everything from the booming audio system to its laundry list of standard features makes the C350 feel special, exactly the emotion you want from a Mercedes-Benz. Fine dining has never been so affordably delicious.